Although the benefit of bimodal listening in cochlear implant users has been agreed on, speech comprehension remains a challenge in acoustically complex real-life environments due to reverberation and disturbing background noises. One way to additionally improve bimodal auditory performance is the use of directional microphones. 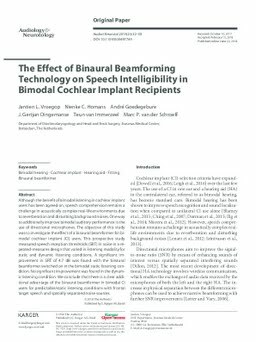 The objective of this study was to investigate the effect of a binaural beamformer for bimodal cochlear implant (CI) users. This prospective study measured speech reception thresholds (SRT) in noise in a repeated-measures design that varied in listening modality for static and dynamic listening conditions. A significant improvement in SRT of 4.7 dB was found with the binaural beamformer switched on in the bimodal static listening condition. No significant improvement was found in the dynamic listening condition. We conclude that there is a clear additional advantage of the binaural beamformer in bimodal CI users for predictable/static listening conditions with frontal target speech and spatially separated noise sources.